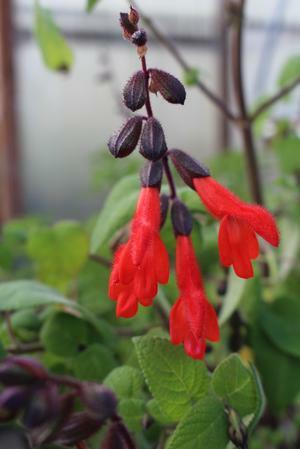 This selection of Salvia gesneriiflora was made by the German salvia officionado, Johannes-Ulrich Urban. It grows quickly to about 5' tall and wide. 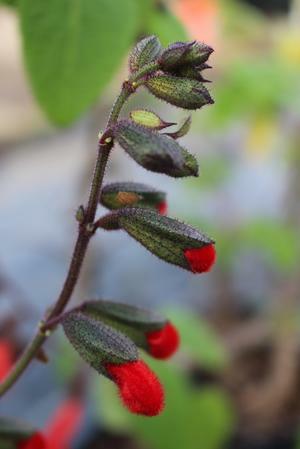 It has large, soft medium-green leaves and orange-red flowers which are the largest of any of the Salvia gesneriiflora currently in cultivation. 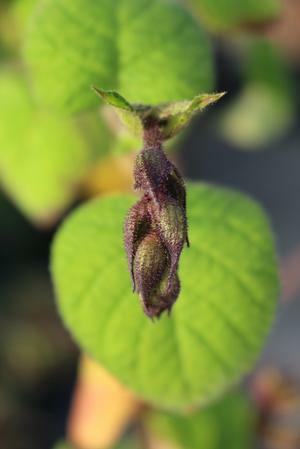 As with all the Salvia gesneriiflora, plant Uli in a spot that's sheltered from the wind because the stems tend to snap at the base quite easily, even though they look thick and strong. Salvia gesneriiflora is native to Sierra Madre Oriental in Mexico. Uli grows quickly to around 5' tall and wide, so is smaller than S. gesneriiflora 'Tequila' and substantially smaller than the straight species which can easily reach 10'. Propagation is by semi-ripe stem cuttings which will often root in as little as 7 days depending on the time of year. Rooting compound isn't essential, but helps hasten rooting. We use a 1:10 solution of Dip 'n Grow or Woods Rooting Compound.